The Fassler Iron Works were founded by Samuel Fassler (1890-1958), and they were located on East 10th St., Manhattan, from around 1912 into the 1940s. Samuel Fassler was the son of Aaron Fassler (1864-? ), an immigrant from Austria, who, in 1910, was the proprietor of a trucking company. The family in 1910 lived at 726 East 9th St., Manhattan, and consisted of Aaron Fassler, his wife, Gussie, and seven children. Samuel Fassler was 20 years old and an iron worker. Samuel Fassler's life was summarized in his obituary in the New York Times, 4 Nov. 1958, p. 27, "Samuel Fassler, City Commissioner of Buildings a quarter of a century ago and a trustee of Yeshiva University, died yesterday in his home at 39 Fifth Avenue. His age was 69. He had been president of the Fassler Iron Works, 439 East Tenth Street, since its establishment in 1912. For more than twenty years he served on the board of trustees of the university. Mr. Fassler was chairman of Yeshiva's building committee for the $1,500,000 men's residence hall opened last year on Amsterdam Avenue and 184th Street. "In 1931 he was appointed Manhattan Superintendent of Buildings, two years later changed to the rank of Commissioner with authority over all five boroughs. He served under four Mayors, James J. Walker, Joseph V. McKee, John P. O'Brien and Fiorella H. La Guardia. He retired in 1937. "Born in Austria, Mr. Fassler went to work at 13 as a handyman in an ironmonger's yard here. He was a foreman within four years, a plant superintendent at 19 and in search of his own business at 21. "He joined the Walker Administration ten days after Charles Brady had resigned from the Department of Buildings... The department was reorganized by him. A new elevator code abolishing the speed limit and permitting two cars in one shaft was introduced by Mr. Fassler to encourage building. Times were such that when he took office construction in New York was 66 per cent below the previous year; a sharp upswing in 1934 brought 100 per cent more new building. Mr. Fassler became chairman of the Bureau of Buildings, a move toward consolidation. He fought long for a revised building code, finally adopted by 1937 but with provisions that annoyed him. He won control of much fire-prevention work from the Fire Department, though not easily..."
Samuel Fassler is described as follows on The Political Graveyard: "Samuel Fassler (c.1889-1958) - of Manhattan, New York County, N. Y. Born in Chernowitz, Austria-Hungary (now Chernivtsi, Ukraine). Married to Ruth Schlanger. Democrat. 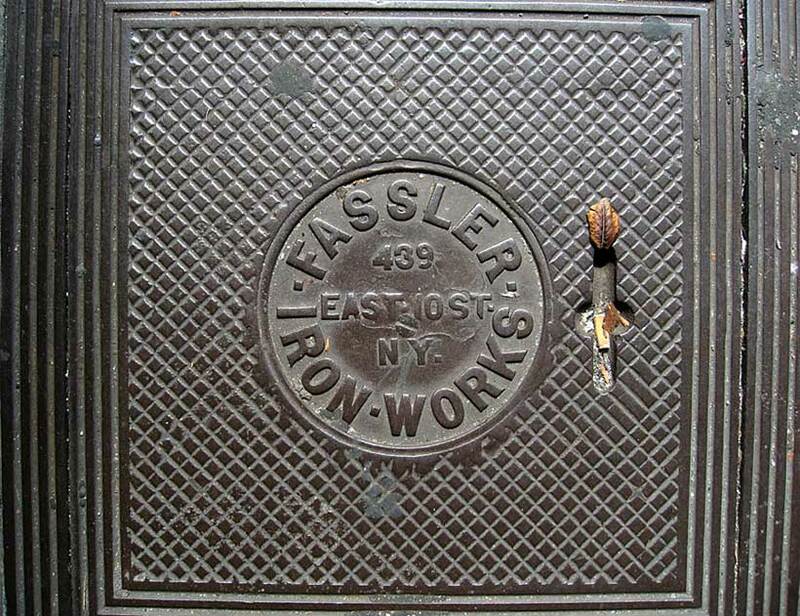 President, Fassler Iron Works; New York City Commissioner of Buildings, 1933-37..."
Another Fassler coat chute cover is found on East 47th St. in Manhattan.